The Power Loop Hike…need more explanation? This favorite 9.25 mile loop has 4 ‘ups’ or creek-to-ridge ascents, which is 1800 feet of cumulative ‘up’ elevation change. If you finish it in 4 hours, you’re walking good; in 3 hours you’re marching; and in 2 hours you’re smokin’. About a 1/3 of the loop is on the Sheltowee Trace. This is one of the best loops in the Daniel Boone NF. Imagine the scene around Clear Creek Iron Furnace in the 1830’s, the trailhead for this hike. Scores of men were clearing old growth trees by acres a week, cutting limestone from the creeks, and hauling iron ore rock from neighboring hillsides to fuel one of largest iron furnaces in Kentucky. Iron was produced roughly nine months out of the year. The process was a laborious affair, but the profit was great until much larger deposits of iron ore were found in the southern Appalachians and around the Great Lakes. The cut wood was slowly burned in dirt covered pit to make charcoal. The furnace was ‘charged’ from the top in layers of ore, charcoal, and limestone and when full, the furnace was stoked with forced air until the charcoal was white-hot and the whole furnace roared tremendously and blasted heated air, flames, and a shower of sparks from the top. That’s when the furnace was in blast and slowly molten iron would flow from furnace bottom and fill trenches of sand to make pig iron ingots. The iron ore found in rocks is basically rust and is rendered as elemental iron in series of chemical reactions in the furnace. Today you can still see many aspects of the furnace operation. The hand-cut limestone furnace still stands. Glass and slag are found downstream. The fuel for charcoal of course grows around abundantly. The limestone outcrops as you ascend the trail south from furnace. The Sinks is a sinkhole in the limestone bedrock produced by the slow process of erosion. Atop the southern extent of this trail, you’ll find the same rugged sandstone the produces the great rockshelters in the Red River Gorge. In fact, if you continue hiking the Sheltowee Trace south, you’ll travel through the heart of the Gorge. Furnace Arch is a low broad arch that resembles the iron furnace in shape. The sandstone outcrops in the area offer a few campsites, though no water along the ridge top. The scenic quality of this area, with blooming rhododendron against craggy boulders, is worth a day of exploration. A hike from Gray’s Arch Trailhead to D. Boone Hut and Martin Fork. A large area of ferns can be found on near the crossing of Martin Fork and scenic overlooks offer limited views down the valley and across the valley to Tunnel Ridge Road. Auxier Ridge is one of the great hiking areas in the Red River Gorge. Hikers have two loop options here. First, you can hike out the Ridge on trail #204, passing some excellent scenic overlooks, and return on Trail #202, Courthouse Rock trail. The second option is to return by way off Auxier Branch Trail, #203, with a side trip to Double Arch. This second option uses the closed Tunnel Ridge Road to connect back to the trailhead. This well-used and maintained trail is the first (or last) segment of the challenging 10-mile Power Loop Hike. Starting at Gray’s Arch trailhead parking (map) walk a short quarter-mile double-width foot trail to an intersection with the Martin’s Fork Trail. Continue to the right passing the small field on Butterfly Hill. About a mile into the hike, you’ll find a few ridge top campsites west of the trail. An unmapped trail follows a narrow ridge above Left Flank climbing area. The best trail in the Clifty Wilderness Area. Starting at Rock Bridge trailhead and hiking down Swift Camp Creek as it cuts a steep, narrow gorge, you’ll experience the least-visited area in the Red River Gorge. Trail often skirts cliff edges and side trails wind down to the creek and cool water in the summer heat. Nice campsites exist near Pooch’s Turtle Falls, Don Juan’s Garden, and Steamboat Rock. Tower Rock Trail is an easy hike to a monolithic outcropping of eroded sandstone. Chimney Scenic Picnic Area is the start of the two shortest, but most rewarding trails in the Gorge. Both trails visit splendid overlooks and many additional miles of side trails connect with picnic area. The camping area is a nice ridge to explore. The Sheltowee Trace spans the entire length of the Daniel Boone National Forest and a portion of the Big South Fork in Tennessee. The section through the Red River Gorge is one of the most spectacular, with this short segment visiting some of the most impressive overlooks and challenging side trails. Indian Staircase is an unofficial trail that climbs up a steep set of cliff ledges and can be found on the printed map. Although this loop uses part of a paved road, hikers have a chance for a short walk to the Red River suspension foot bridge, the longest in the forest. The Rough Trail is longest trail through the heart of the Red River Gorge. Many side trail options allow hikers to increase mileage and create additional loops. 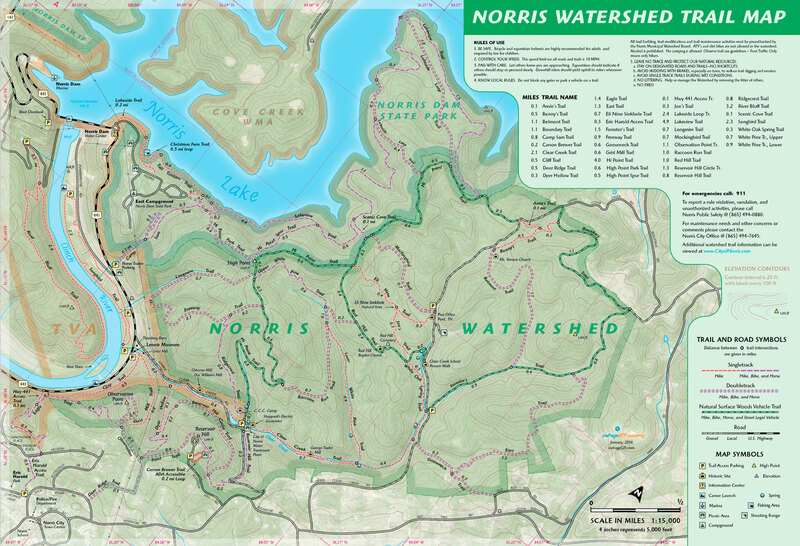 For the ultimate Gorge experience, connect this trail with the Swift Camp Creek Trail. The Wildcat Loop begins at the eastern terminus of the Rough Trail. The trail descends into Sons Branch while passing large stands of rhododendron and hemlock trees. At the intersection with Swift Camp Creek, hikers can cross the creek to find large camping areas. After about a mile hiking up Sift Camp, Don Juan’s Garden presents a majestic grove of hemlocks along an impressive cliff known as Wildcat Wall. After returning to the ridge on trail #228, the Wildcat Trail, hikers can find abundant lady slippers in spring.